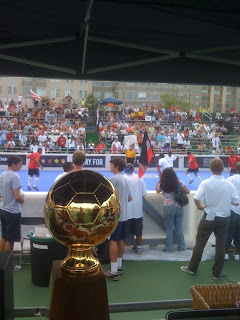 Street Soccer USA: SSUSA Cup 2010 Kicks Off! SSUSA Cup 2010 Kicks Off! View of the Game field with Leonsis Trophy as DC2010 kicks off. 23 teams, from 20 cities, a samba band, 200 people striving to overcome homelessness, and a lot of people there to cheer them on . . . that's the Street Soccer USA Cup. Thanks to individual volunteers, donors, and companies like Deloitte, which has offered project management support all year to Street Soccer USA, and the likes of Nike, Microsoft, and Powerade--all new sponsors this year---the SSUSA Cup kicked off in tremendous fashion. Check in on Saturday afternoon when the first round concludes for the latest scores and commentaries. NEW Article-MN Team in Star Tribune! SS in Detroit News, Read up and Watch Video!